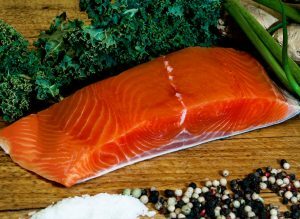 Wild Alaska Salmon and Seafood Company now offers Free Shipping on Special Orders of $150.00 or more. Unfortunately, we can only extend this offer to customers located in the 48 contiguous states. We strive to keep our shipping tables for orders under $150.00. If you feel the shipping fee is not correct, please contact us and we will check it for you. Shipping is calculated separately for each delivery address from our Central US warehouse location. All items ship via FedEx Ground or FedEx Express service depending on destination. We do offer a “rush” shipping option for an extra fee available at checkout that will ship via FedEx Standard Overnight Express Service. All orders are shipped via FedEx either by Ground or Express service depending on destination. We do also offer “Rush” Overnight Service for an additional Fee. We only ship orders that will arrive Tuesday – Friday for any service type used, including “Rush”/Overnight Delivery. Orders are shipped via FedEx Ground; Monday & Wednesday (except holidays), and arrive within 1-3 days, depending upon destination. Ground service with 3 day transits will only ship on Mondays. Orders shipped via FedEx Express; Monday (except holidays), and arrive within 1-3 days. Orders placed on Monday & Tuesday will ship on Wednesday (except 3 day transits, which will ship the following Monday). Orders placed Wednesday – Sunday will ship on Monday. We will notify you of the shipping schedule once your order is received. Only orders placed that select the “Rush” Delivery option at checkout for an additional fee will be shipped via Standard Overnight Service. Fees for Rush delivery are an additional $60 for destinations in the continental US and $100 fee outside of the continental US. Orders are shipped via FedEx Standard Overnight, Mondays & Wednesdays (except holidays), and arrive within 1 day. Orders placed on Monday & Tuesday will ship on Wednesday. If you need an order to arrive on Saturday, please contact us to make special shipping arrangements. Additional fees will apply. Our orders are carefully packed using dry ice inside insulated inserts in a corrugated shipping box. Your fish will remain frozen for you to put right in the freezer until you’re ready to eat! Online orders receive emailed order confirmation and invoices. Shipping confirmation will be emailed on the shipping day which also includes a tracking number. 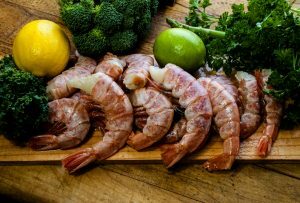 Wild Alaska Salmon and Seafood Co. will also be tracking each order to ensure proper delivery. Occasionally there are weather delays or delays during peak holiday periods that are beyond our control. In the event of any delay we will notify you as soon as possible with a status update. Please also note that we cannot ship to APO/FPO, PO Box’s or Rural Routes. Seafood is calculated by the pound and added at the end of the checkout process. Shipping charges include FedEx shipping service (ground or Express), processing and handling of dry ice and shipping box. We are not liable for orders that are not retrieved in a timely manner. Perishable products should be kept frozen upon receipt…or refrigerated if consuming immediately. Very slight thawing of non-smoked/raw frozen product may be safely re-frozen with no perceptible loss of quality or nutritional value. However, it is not recommended to re-freeze completely thawed non-smoked/raw product. Unopened vacuum packed smoked salmon packages should be stored in the freezer and have a refrigerated shelf life of about 2 weeks. After opening smoked salmon packages, they should be stored in the refrigeratedand consumed within two weeks. Unopened raw salmon packages should be stored in the freezer. 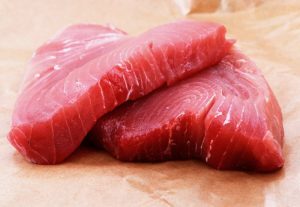 DO NOT keep SEALED vacuum packages of raw salmon in the refrigerator for longer than 2 days. 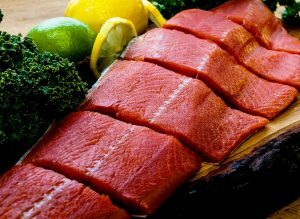 After opening raw salmon it is best to consume within 3 days of thawing, or keep frozen until ready to use. It is not recommended to re-freeze raw salmon. We take great pride in our products and to insure that every customer is completely satisfied with their order. 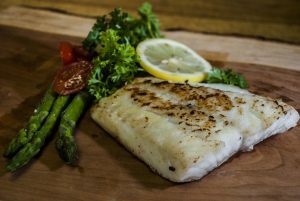 If for any reason you are not completely satisfied please send an email to info@wildalaskasalmonandseafood.com or call (907) 290-0992 so we can make it right.